Sleek, simple architecture creates an ideal background for the bright colors and bold textures of this new Minneapolis home to shine. In the living area, a glass waterfall coffee table allows the vibrant colors of a multihued Jan Kath rug to take center stage. This is exactly what happened when homeowners Tim and Mekea Duffy moved in. Longtime residents of Linden Hills, the two had settled into their very first home in the charming and historic neighborhood after living in New York City. Toting two toddlers and a baby at the time, they knew they would eventually need more space to accommodate their growing family. Upon finding the home that was being built, the two jumped at the chance to stay in the neighborhood they had grown to love. Newman, the family’s Boston terrier, poses in front of the bold wallpaper in the home’s mudroom, which features a hot pink abstract design by Lindsay Cowles. “The timing was perfect. The house was framed but not finished when we stepped in and purchased it, so we tweaked the design as much as we could and helped finish it with flooring, paint, and detail. It was much easier than starting from scratch,” says Mekea, who enlisted local interior designer Brooke Voss of Brooke Voss Design to help the couple add in their own aesthetic and style with furnishing and décor. The home’s sleek, simple architecture, clean lines, and open floor plan naturally spoke to contemporary Scandinavian design vibes, so the couple opted for bleached wood floors and painted the walls, trim, and exterior Benjamin Moore Super White, a brilliant, almost sparkling shade that provided the perfect palette to layer on bold color and texture—elements both Mekea, a self-described “go-big-or-go-home” person when it comes to design, and Voss adore. Contemporary chairs paired with a traditional table create an interesting tension in the space. 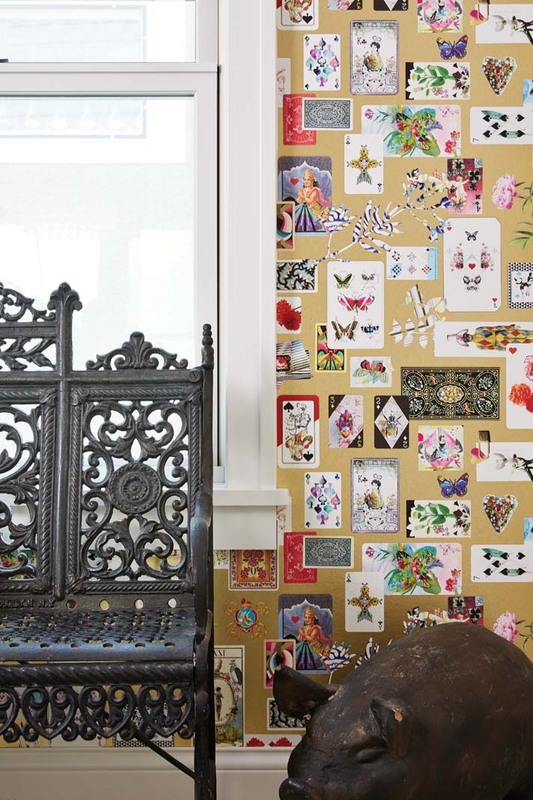 In the entry, Christian Lacroix wallpaper featuring antique playing cards greets guests upon arrival. The house’s simple exterior gives way to an open, airy space awash in color, with bright hues found everywhere from the rug in the living room—featuring cheerful shades of aqua, orange, rose pink, and spring green—to the playful wallpaper plastered on surfaces throughout the home. 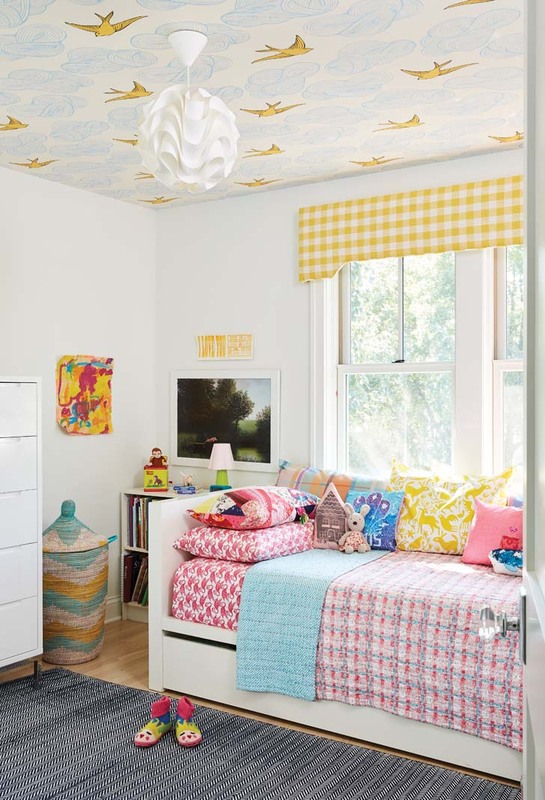 While colorful antique playing cards catch the eye in the entry and a hot pink abstract pattern makes an edgy-yet-feminine statement in the mudroom, delicate bird-and-cloud designs create a dreamy ambiance in the kids’ upstairs bedrooms. 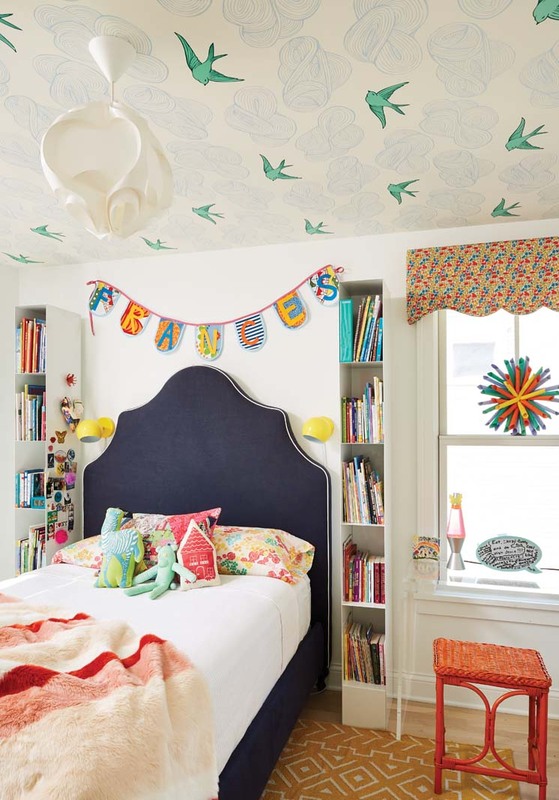 Upstairs, the daughters’ bedrooms feature bold patterned rugs, Julia Rothman wallpaper on the ceilings, and plenty of colorful accessories. While each room is unique to each girl’s personality, the repeated elements help create harmony across all three upstairs spaces. The dining room is a prime example of this careful combination, featuring a traditional-style Bausman & Company table paired with contemporary woven chairs, and a vintage glass display cabinet filled with an assortment of modern dishes. “When you mix old vintage and antiques with brand-new pieces, a tension develops between them that’s really interesting,” explains Voss. A round Ochre chandelier hangs above the dining table, where woven Moroso armchairs make a memorable statement. With some quirky design choices and a liberal splash of color, what started out as a simple predesigned model home turned into a truly custom abode for the Duffys, who plan to continue working with Voss as they feather their nest with new and unique pieces. “It’s really a great example of a house designed to fit many homeowners that was brought to another level through a wonderful first owner who put lots of thought and personality into it,” says Larson.